Nutrient pollution released to freshwater and coastal areas comes from many diverse sources including agriculture, aquaculture, septic tanks, urban wastewater, urban stormwater runoff, industry, and fossil fuel combustion. 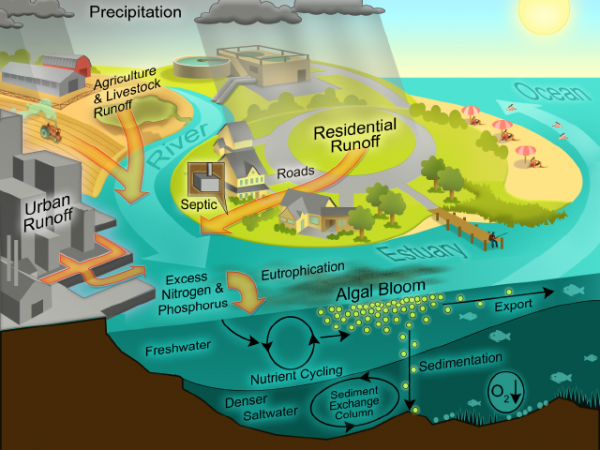 Nutrients enter aquatic ecosystems via the air, surface water, or groundwater (Figure 1). From region to region, there are significant variations in the relative importance of nutrient sources. 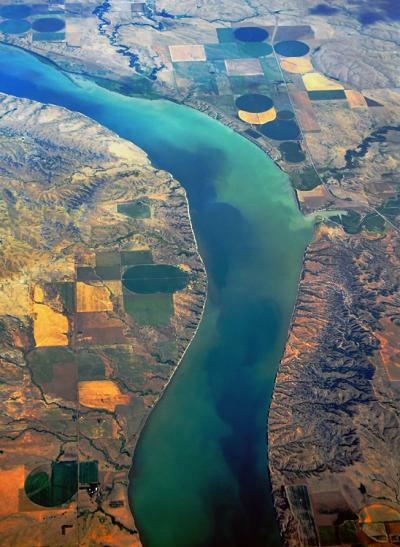 For example, in the United States and the European Union, agricultural sources—commercial fertilizers and animal manure—are typically the primary sources of nutrient pollution in waterways, while urban wastewater is often a primary source of nutrients in coastal waterways of South America, Asia and Africa. Fig 1. Schematic diagram of the different pathways of nutrient deposition into coastal waters and ensuing processes leading to eutrophication (algal blooms) and hypoxia. Larger version. Agricultural nutrient sources include fertilizer leaching and runoff from agricultural fields; manure from CAFOs; and aquaculture operations. Between 1960 and 1990, global use of synthetic nitrogen fertilizer increased more than sevenfold, while phosphorus use more than tripled. Studies have shown that fertilizers are often applied in excess of crop needs (MA 2005). The excess nutrients are lost through volatilization (when nitrogen vaporizes in the atmosphere in the form of ammonia), surface runoff (Figure 2), and leaching to groundwater. On average, about 20 percent of nitrogen fertilizer is lost through surface runoff or leaching into groundwater (MA 2005). Synthetic nitrogen fertilizer and nitrogen in manure that is spread on fields is also subject to volatilization. Under some conditions, up to 60 percent of the nitrogen applied to crops can be lost to the atmosphere by volatilization (University of Delaware Cooperative Extension 2009); more commonly, volatilization losses are 40 percent or less (MA 2005). A portion of the volatilized ammonia is redeposited in waterways through atmospheric deposition. Phosphorus, which binds to the soil, is generally lost through soil erosion from agricultural lands. Fig 2. Nutrients and sediments entering the Mississipi River in the form of surface runoff. The latter is considered to be the main source of nitrogen into the Gulf of Mexico (Rabalais 2002). The rapidly changing nature of raising livestock over the last century has also contributed to a sharp increase in nutrient levels. Animal production is intensifying, and as a result, more production is occurring further away from feedstock supplies, making it harder to spread the manure. The large quantity of manure produced by these operations is applied to land as fertilizer, stacked in the feedlot, or stored in lagoons. Frequently, an oversupply of manure means that it is applied to crops more than is necessary, further exacerbating nutrient runoff and leaching. In China, meat production rose by 127 percent between 1990 and 2002 (FAO 2009a), but fewer than 10 percent of an estimated 14,000 intensive livestock operations have installed pollution controls (Ellis 2007). In the Black Sea region, one swine operation—which subsequently closed—had over 1 million pigs and generated sewage equivalent to a town of 5 million people (Mee 2006). Fig 3. Diagram illustrating the mechanisms by which aquaculture can contribute to eutrophication and hypoxia. (click here for larger version). Aquaculture (fish farming) is another growing source of nutrient pollution. Annual aquaculture production worldwide increased by 600 percent in twenty years, from 8 million tons in 1985 to 48.2 million tons in 2005 (Figure 3). Today nearly 43 percent of all aquaculture production is within marine or brackish environments, with the remainder in freshwater lakes, streams, and man-made ponds (FAO 2007). 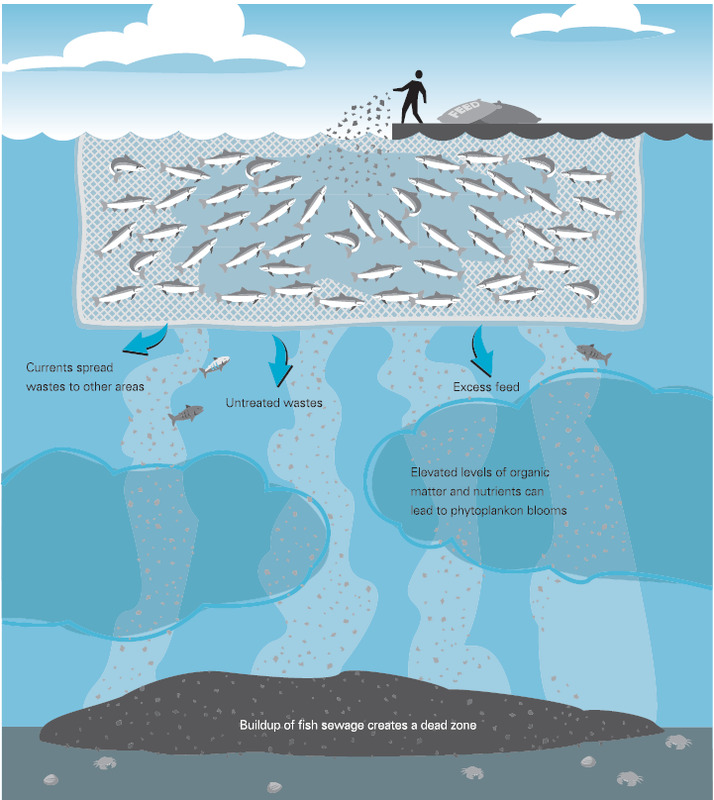 Marine fish and shrimp farming often occur in net pens or cages situated in enclosed bays. These farms generate concentrated amounts of nitrogen and phosphorus from excrement, uneaten food, and other organic waste. If improperly managed, aquaculture operations can have severe impacts on aquatic ecosystems as nutrient wastes are discharged directly into the surrounding waters. For every ton of fish, aquaculture operations produce between 42 and 66 kilograms of nitrogen waste and between 7.2 and 10.5 kilograms of phosphorus waste (Strain and Hargrave 2005). Municipal wastewater treatment plants and industrial wastewater discharges, nitrogen leaching from below-ground septic tanks, and stormwater runoff are some of the urban and industrial sources of nutrient pollution. Municipal and industrial sources are considered “point sources” of nutrient pollution because they discharge nutrients directly to surface waters or groundwater via a pipe or other discrete conveyance. They are typically the most controllable sources of nutrients and are often regulated in developed countries. Table 1. Percentage of sewage treated in different regions worldwide (click here for larger version). The most prevalent urban source of nutrient pollution is human sewage, though its importance varies by region and country. Sewage is estimated to contribute 12 percent of riverine nitrogen input in the United States, 25 percent in Western Europe, 33 percent in China, and 68 percent in the Republic of Korea (MA 2005). This variation is due, in large part, to differences in sewage treatment levels among countries (Table 1). In developing countries, fewer than 35 percent of cities have any form of sewage treatment (UNEP and WHRC 2007), and when sewage is treated, it is typically aimed at removing solids, not nutrients. Households in developed countries often use septic systems when they are not connected to municipal wastewater treatment plants. Septic systems are designed to purify waste by leaching it through soils. They leach, on average, 14 kilograms of nitrogen per system per year—much of which reaches groundwater or nearby surface waters (Ann Arundel County Maryland DPW 2008). Stormwater runoff is another significant source of nutrients from urban areas. Rainfall events flush nutrients from residential lawns and impervious surfaces into nearby rivers and streams. In some cities, combined sewer overflow (CSO) systems worsen stormwater runoff problems. CSOs are designed to collect rainwater, domestic wastewater, and industrial wastewater in the same pipe. During heavy rain or snowmelt, wastewater volume can exceed the capacity of the CSO system, as well as that of the wastewater treatment plant receiving the flow. As a result, the excess wastewater, including raw sewage, is discharged directly into nearby streams and rivers. In the United States, over 772 cities had CSOs in 2007 (EPA 2007). For industrial sources of nutrient pollution, certain industries are larger sources than others. Pulp and paper mills, food and meat processing, agro-industries, and direct discharge of sewage from maritime vessels are some of the larger sources of industrial nutrient pollution. Fig 4. 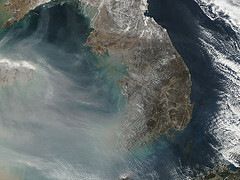 Smog from industry and vehicles originates in China and is blown over Yellow Sea towards Korea. Atmospheric deposition of NOx is a significant source of nitrogen to the Yellow Sea which suffers from severe symptoms of eutrophication. When fossil fuels are burned, they release nitrogen oxides (NOx) into the atmosphere. NOx contributes to the formation of smog and acid rain. NOx is redeposited to land and water through rain and snow (wet deposition), or can settle out of the air in a process called dry deposition. Coal-fired power plants and exhaust from cars, buses, and trucks are the primary sources of NOx. 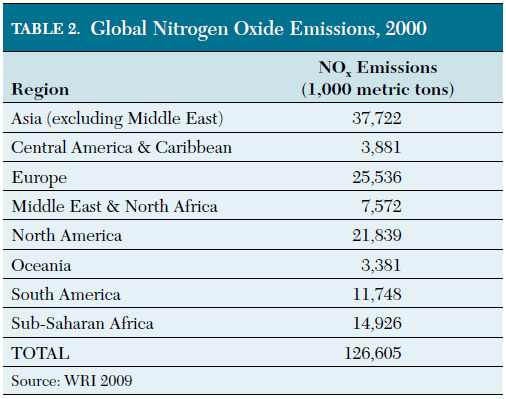 Fossil fuel combustion contributes approximately 22 teragrams of nitrogen pollution globally every year (Table 2), approximately one-fifth of the contribution of synthetic nitrogen fertilizers (MA 2005). In the Baltic Sea, atmospheric deposition, primarily from burning fossil fuels, accounts for 25 percent of nitrogen inputs (HELCOM 2005). Similarly, in the Chesapeake Bay, atmospheric deposition accounts for 30 percent of all nitrogen inputs. In some areas, such as in the U.S. North Atlantic, atmospheric deposition of nitrogen can exceed riverine nitrogen inputs to coastal areas (Spokes and Jickells 2005).